Scanning the area before you cut lessens the amount of utilities, rebar, post-tension cables, and conduits from being hit. This assists with a safer working environment, and results in less chance of a potential shut down of the facility. This is good for both you and Finish Line Concrete Cutting. GPR (Ground Penetrating Radar) is a radar-based technology utilizing antennas to transmit and receive pulses of electromagnetic energy through the concrete. 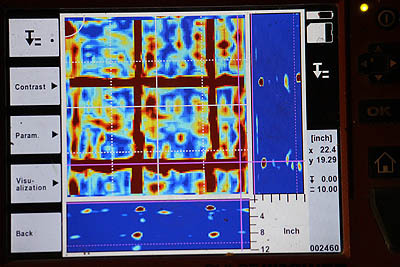 As the scanner is moved along a concrete surface, electromagnetic waves are reflected from objects beneath this surface. These objects immediately show up on the display. Is Ground Penetrating Radar Safe? GPR emissions do not present any health hazard to the operator or persons nearby. This system eliminates the need to vacate premises while under operation. There should not be sensitive radio sites/systems in the near vicinity however. What Types of Scanning Can Be Performed? The Imagescan mode is used to analyze a certain section or area of a wall, floor or ceiling.It provides more detailed information about the situation of the embedded objects in a top view and cross-sectional view, thru 2 dimensional and 3 dimensional images generated from the data. The Quickscan mode consists of a single-axis real-time scan that can find embedded objects, to enable the operator to mark them directly on the wall, floor or ceiling. It is a fast-check scan that provides a cross-sectional view. How Many Layers Can be Seen? 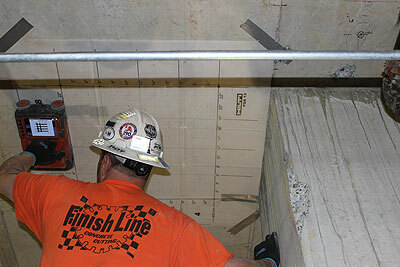 The equipment Finish Line Concrete Cutting utilizes can detect multiple layers of objects embedded in concrete. The depth measurement performance and layer detection ability, however, is affected by certain limiting factors. These factors include concrete permittivity or density, rebar spacing, the material from which the embedded objects are made, and their depth and size. What is the Capacity of Electrical Conduit Identification? The scanner can locate PVC or metal electrical conduits. It cannot identify the class of material, it can only identify the object layout, approximate depth, geometry and position of the conduit. Can Scanning be Performed on Final Finishes? 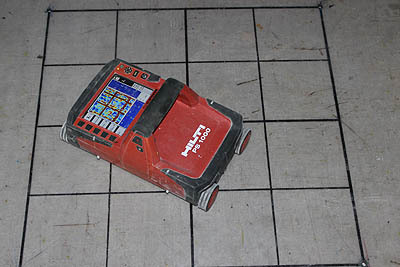 The scanner can be used on final flooring, however the results obtained when scanning over tiles may not be satisfactory or the depth range achieved may not be adequate. Tiles often contain quartz which may cause interference with radar waves. Additionally, plastic sheeting, metal shields, and air layers in multi-layer structures may result in similar limitations. The scanner can be used on plasterwork and insulation layers, but its performance will be reduced accordingly. It is designed to be used directly on concrete surfaces and any additional layers will negatively affect its performance. Call us today at 888-950-5463.